King international presents this amazing oil pot gravy is exclusively designed for you to make your cooking more easy and convenient. It is made up of high quality stainlesss steel material that makes it durable and unbreakable and its elegant and firm construction makes it more advanced. This oil pot comes with a smart pipe for smart flow and you can easily pour liquids to the container. 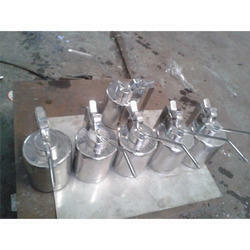 we are offering a wide assortment of SS Oil Can. 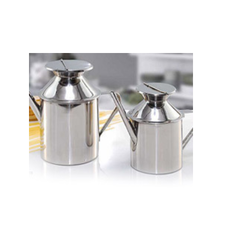 These oil cans are manufactured using high-grade stainless steel and advanced machinery in conformity with industrial values..Precisely designed under the supervision of our skilled craftsman, this product has gained huge demand in domestic market. We manufacturing SS Oil for various industries like pharmacueticals and Chemicals. This Funnel are made from SS316, SS304, SS202 as per client requirement. Capacity: 350ml ,500ml ,750ml ,1000ml ,1200 ml. Backed by a rich industrial experience, we are engaged in bringing forth a comprehensive variety of SS Oil Can. Being a trustworthy name in the industry, we are able to offer a superior quality array of Stainless Steel Oil Can to our patrons.